British diesel engine innovator, Cox Powertrain, will today reveal one of the marine industry's most highly anticipated engines at Fort Lauderdale International Boat Show (FLIBS). Following an intensive ten-year development program, the CXO300 will be unveiled during an exclusive media preview prior to the show's official opening. Visitors to the show will be able to see Cox's impressive pre-production engines on the Intrepid Powerboat booth where a twin-engine installation will be fitted to the transom of Intrepid's new 345 Nomad Centre Console located at Bahia Mar/Hall of Fame/Las Olas Marina Show 2018, Red Zone G Dock 700-714. Delivering 300hp at the propeller, the CXO300 is the world's highest power density diesel outboard engine and is set to revolutionize the US recreational boating market. The final engine concept is based on the proven technology of a 4-stroke, V8 architecture. Weighing just 375kg, it offers at least a 25% better range compared to a gasoline outboard and is designed to last up to three times longer. Users could save as much as three times the $50,000 retail cost of the CXO300 over the lifespan of the outboard due to its long life, fuel efficiency, long service intervals and reduced haul-out costs. Cox Powertrain's Global Sales Director, Joel Reid said: "Fort Lauderdale is the obvious choice for this significant launch. The area is a magnet for recreational boat owners and sports fishermen, and the number of twin, triple and quad outboard powered boats sold in Florida every month is staggering. Demand from this region has already exceeded our expectations. "We have worked tirelessly to establish an exclusive team of distributors, covering sixty countries across the globe," continued Reid. "A strong and lasting relationship with boatbuilders is also crucial to our success and we are delighted to name Metal Shark and Intrepid Powerboats as the first boat builders to formally partner with us in the commercial and recreational marine sectors respectively." "Metal Shark is pleased to partner with Cox on the integration and introduction of these new, game-changing outboards," said Metal Shark's CEO Chris Allard. "Our law enforcement, and commercial clients worldwide have eagerly awaited the arrival of high powered diesel outboards and it's an honor for us to help bring this new technology to market. Having worked with Cox for two years we are thoroughly impressed with the product, the company, and the vision." The Fort Lauderdale-based Intrepid Powerboats is collaborating with Cox Powertrain for the launch of its game-changing diesel outboard and will be a prominent OEM partner of the UK-based engineering specialist. Ken Clinton, President of Intrepid Powerboats, said: "We are extremely excited that Cox has chosen us to help bring them into the marketplace. We have been looking for a diesel outboard for quite some time now and can't wait to get some time on these engines. With many of our boats being tenders to the mega yacht market, we continue to get requests for diesel applications because they do not want to carry gasoline. With the fuel efficiency, low maintenance and dependability that diesel technology brings, I am very excited about the future of the CXO300." 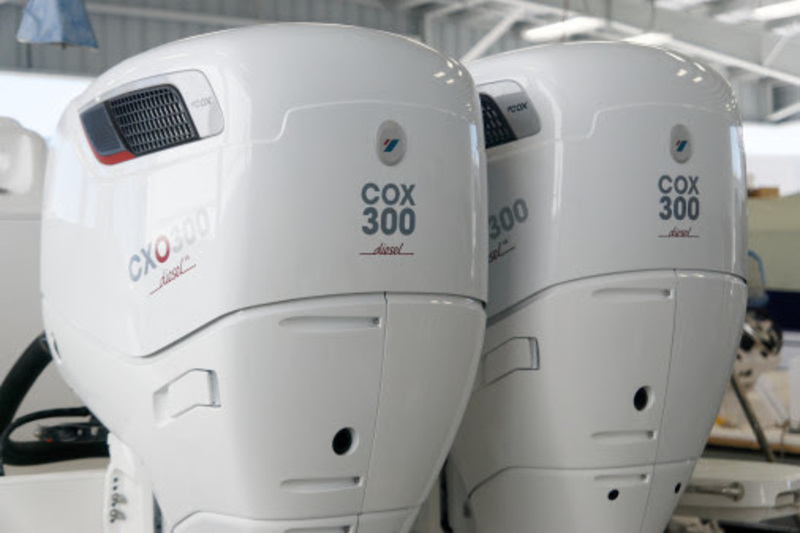 FLIBS marks the opening of the order books for the CXO300 and the start of Cox Powertrain's customer demonstration program. Visitors will be invited to sign up to one of the many on-water demonstrations that will take place throughout North America from November 2018 through Spring 2019.